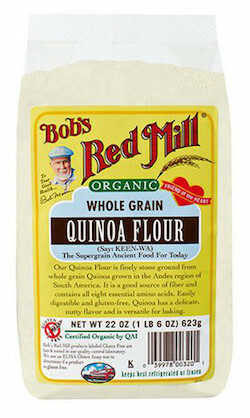 Bob's Red Mill Quinoa Flour is finely stone ground from whole grain quinoa grown in the Andes region of South America. It is a good source of fiber and contains all eight essential amino acids, making it easily digestible. With its delicate, nutty flavor and versatility, gluten-free quinoa flour adds a more healthful twist on standard baked goods and pan-fried favorites such as breads, pancakes and waffles. Substitute this flour for half of the all-purpose flour in recipes. This flour also pairs well with fruits, nuts, spices like cinnamon, cardamom, cumin and coriander, as well as herbs like rosemary. Substitute this flour for half of the all-purpose flour in many recipes, or completely replace wheat flour in cakes and cookie recipes. Quinoa flour imparts its unique, nutty yet earthy flavor to your favorite baked goods.